A major benefit of receiving orthodontic treatment in childhood is that it's possible to take full advantage of a youngster's own natural growth process to treat or even prevent malocclusions (“bad bites”). 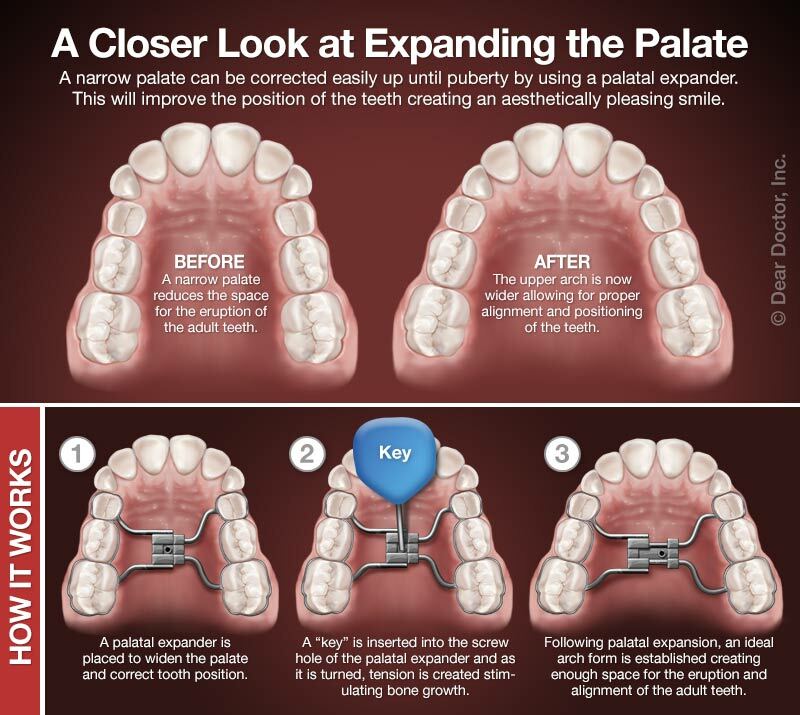 A palatal expander is a device designed to help us do that. Palatal expanders create more space in a child's mouth by gradually widening the upper jaw. Although this may sound scary, it's really quite easy — both to do and to tolerate. That's because the upper jaw (maxilla) actually develops as two separate halves that don't completely fuse together until sometime after puberty. Before that happens, the two bones can gently be separated and stabilized over a period of several months. Crossbite — When a child's upper jaw is too narrow to fit correctly with the lower jaw, the back top teeth will bite inside of the lower teeth instead of outside. This can be corrected by expanding the upper jaw. Crowding — Even before all of a child's permanent (adult) teeth come in, we can tell when there will not be enough room to accommodate them. Widening the upper jaw can create the necessary space without the need for tooth extractions. 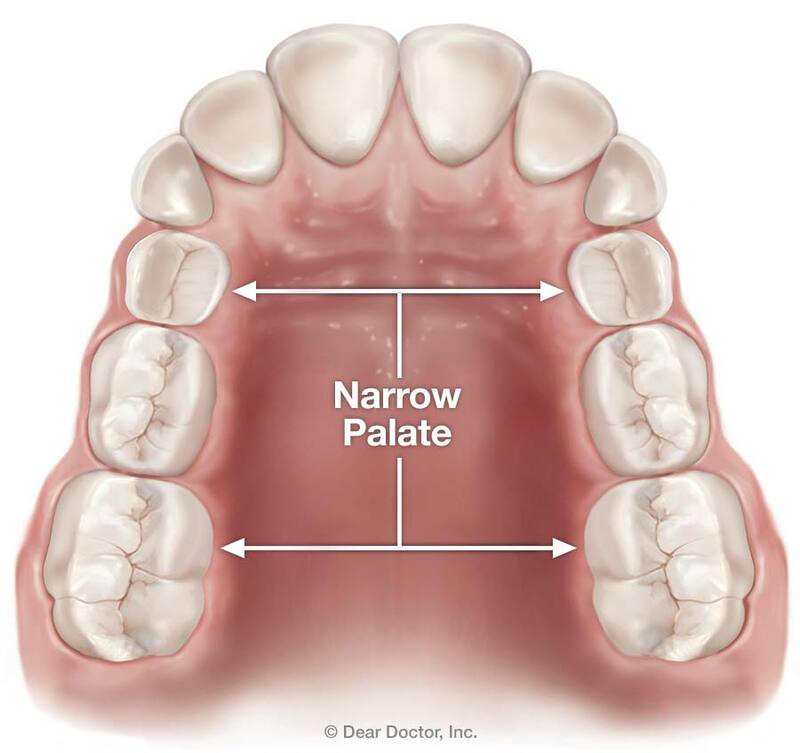 Impacted Teeth — When a tooth that hasn't come in (erupted) yet because it is blocked by other teeth, widening the upper jaw can allow it to erupt into proper position on its own. This most often happens with canine or eye teeth — the pointier ones located directly under the eyes. Expanding the upper jaw has other benefits: It can broaden the smile in an aesthetically pleasing way, it can limit the number of teeth that need to be removed to create space and can also improve breathing. And it can shorten overall orthodontic treatment time (the amount of time your child will need to wear braces). An expander is custom-made for each individual and fits over several top teeth in the back of the mouth. The appliance has two halves that are connected in the middle with a screw. To activate the device, you simply turn the screw a very small amount each day with a special key. This induces tension at the junction of the two palatal bones, causing them to gradually move apart. Once the desired expansion is achieved, we will leave the appliance in for a few more months to allow new bone to form in the gap and stabilize the expansion. Generally, expanders are worn for 3-6 months altogether. There can be some soreness or a feeling of pressure for a few minutes after the key is turned, but activating an expander actually causes less discomfort than having braces tightened. Your child may find that speaking and eating feels different at first as the tongue adjusts to the presence of the appliance. It is also completely normal to see a gap develop between the front teeth. This shows that the expander is having the desired effect. When all is said and done, your child's permanent teeth will be beautifully aligned with neither too much nor too little space between them.